QUESTION: Mr. Armstrong; I do not quite understand negative interest rates. Can you explain what these people are doing now? ANSWER: Very simple. You can lend me money. I then return only 98% and the 2% is what you pay for the privilege to lend me money. Makes sense from their point of view. They cannot lower rates to stimulate the economy so instead of considering their policies do not work – hell we just have to go lower yet. They are too stupid to realize that taking interest rates this low wipes out the savers and the elderly. Then the raise taxes to make it unprofitable to invest. They then hate people who speculate or make money through investment. This whole theory of wealth disparity is nuts. It does NOT center on wages – rather investment. Those with savings invest and earn income greater than the average person earns in wages. So this is not fair in the mind of Piketty. What he is really saying, take ALL excess income these people earn from investing and give it to those who do not invest to raise their income to be on par with those who can then no longer invest. Honestly, the thinking is rather strange and very twisted. 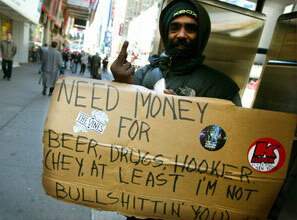 They want you to be a fund manager and hand all your profits to the guy on the street with the cardboard sign. Hey, this guy is at least honest. I would give him something. Way too many say they need money for food and when you say no problem I will buy you a meal, they say just give me the money it’s for later. So the bottom line is simple – negative interest rates is just a new way of TAXING you for saving – having the audacity to live above hand-to-mouth. This is just getting beyond insane – they are really out of their minds stir crazy.